Note : This is a guide aimed at explaining the complete process involved in buying Yureka. 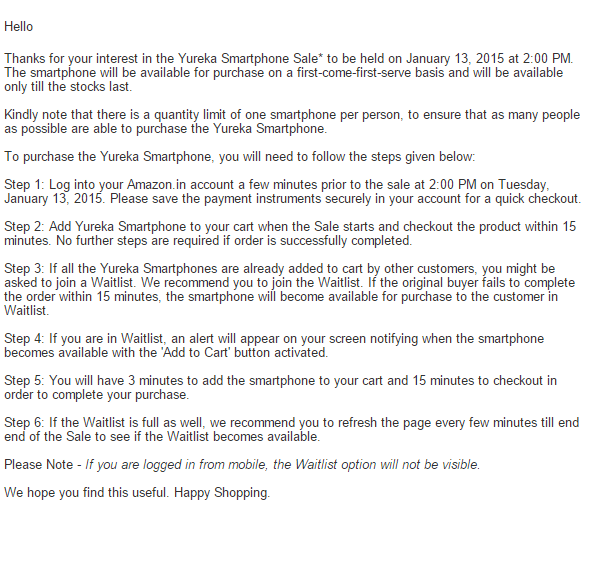 If you're interested in knowing the best steps and tips to buy the Yureka sucessfully skip directly to Part 2. As Yureka is registration only device, first thing you need to do is to register for the sale on Amazon India website Register for Yureka. Note : Registration and Subscription are same. If you've successfully registered you will get a screen like this. Part 1 is over, you may get an email from Amazon confirming your registration. You can use our sales countdown for accurate timing, here :Yureka Sales Countdown. Step 2 : Close all other tabs and open the Yureka Sales Page, at 1:30 PM (or atleast five minutes before the sale) and you will be see a timer, do nothing, wait till 2PM and DO NOT REFRESH, when option comes add to the cart, you will have a 15 minute window to checkout the phone. If you checkout successfully the phone is yours, no other steps needed. Step 4 : If your wait list clears you will be notified, add the phone within 3 minutes and checkout. Step 5 : Please wait till they announce end of sale on the Amazon sales page. 1. Wait list option won't be visible on mobile devices. 2. Only orders placed from Sales Page or the product page on the Deal widget will be successful. Orders from Wishlist, Customer Reviews and all other platforms/functionalities have been disabled. Since the stocks are going to be limited you need to act quick if you want to be among the first to own the Yureka. Also so far Amazon hasn't added the countdown, if they don't, you can use ours to make sure you're on time for the sale : Yureka Sales Countdown. Amazon and YU both has confirmed earlier that COD will be available according to Amazon India's policy. So it COD will be available on all those places where Amazon normally delivers product on COD. For complete list you have to wait till their announcement. How much units going to sale in second time.. It's not been revealed yet, wait for official announcement, we will update it. I have bought a Yureka Phone and it is very nice. But it's proximity sensor is not working for me, when I make a call, my phone is going out of control, and i'm not able to able to do anything in my phone, even I couldn't not be able to know whether the caller person attends or not. I have addressed the same issue to the call center on Saturday, they said, I need to check and update the phone for solving this issue. When I checked updates in my phone, I couldn't see anything. Please do the needful to solve the issue. In how many days Yureka get delivered in bangalore if ordered on sale?? In general you can get product delivered to main city Bangalore within 48-72 hours. You can also choose faster delivery by paying a minimal charge.